Gremolata is a great condiment for adding some lovely fresh flavours. You can switch the ingredients to suit your larder: the garlic can be replaced with shallots, you can use lime instead of the lemon or try mixing some coriander, sorrel or wild garlic leaves with the parsley. 2. Bring the cider, chicken stock and fennel seeds to the boil in a saucepan, then reduce the heat and simmer gently. Season lightly with salt and pepper. 3. Scatter the onion, garlic and thyme over the base of a roasting tray. Place the ribs on top of the onion. Pour the hot cider and chicken stock over, then pour over the tomato passata and cover with foil. Place in the oven and braise for 1½ hours, until the ribs are tender. 4. Meanwhile, cook the potatoes in a large saucepan of boiling salted water for 10 minutes, until tender. Drain and transfer to a roasting tray. Gently crush each potato with a masher. Drizzle with the olive oil and sprinkle with the Parmesan and salt and pepper. Roast in the oven for 35 to 40 minutes, until golden. 5. To make the gremolata, combine the parsley, garlic and lemon zest and juice in a bowl, then mix in the olive oil and some salt and pepper. Cover and set aside. 6. When the ribs are cooked, remove the foil and increase the oven temperature to 220°C/gas mark 7. Baste the ribs with the cooking juices, then drizzle the ribs with the honey. Return to the oven for 5 to 7 minutes, until caramelised. 7. 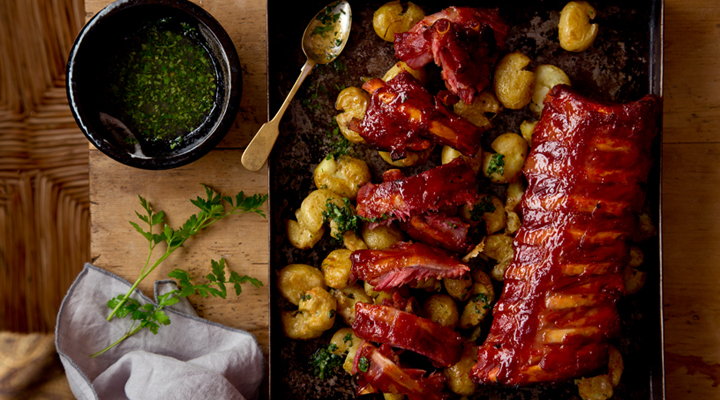 Serve the rack of ribs on a large tray with the smashed potatoes for everyone to help themselves. Spoon the gremolata over the potatoes and enjoy immediately.